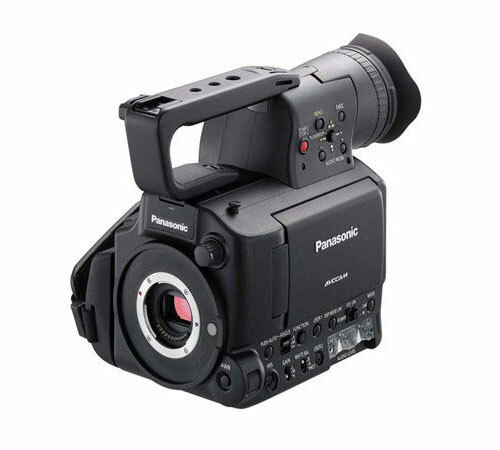 Lease the Panasonic AG-AF100A through Panasonic's 0% Interest Lease Program: Panasonic is offering 0% financing for 12 months on their professional video and display products with 90 day deferred payments for sales equal to or greater than $20K. Panasonic Introduces The AG-AF100 "A Series" Micro Four Thirds Camcorder Featuring Full HD Progressive Recording And 24PsF 10 bit (enhanced 8 bit smoothing) 4:2:2 Camera Output Via SDI Terminal. As with the conventional model AG-AF100 Series, AG-AF100A Series can use a wide range of lenses including Micro Four Thirds compatible DSLR (Digital Single Lens Reflex) lenses, 35mm DSLR lenses and Cinema lenses with appropriate lens mount adapters. In addition to the professional high quality PH mode (average approx. 21Mbps, maximum 24Mbps), AG-AF100A Series complies with the AVCHD ver. 2.0 (AVCHD Progressive) standard in its new PS mode (average approx. 25Mbps, maximum 28Mbps) for recording, playing and outputting (via HDMI only) Full-HD progressive (1080/59.94p, 1080/50p) images. The PS/PH modes support uncompressed 16 bit LPCM 2-channel audio recording. The AG-AF100A Series also features two-channel XLR audio input terminals for full uncompressed Audio recording and many other functions to meet the professional needs. The AG-AF100A Series is now able to output HD signals with 10 bit 4:2:2 (enhanced 8 bit smoothing), quality via the camera's live output function and record onto the external devices, such as a P2 Recorder. The 10 bit signal is generated by smoothing process and is not a native 10 bit signal. The real benefit of it is that there is a smoother transition over the gradation of tones with in the frame of video. The SDI signal also carries a sync signal for the Rec Start/Stop with the AG-AF100A series trigger. Additionally the AG-AF100A Series is newly equipped with the clamored for expand focus assist function, which enlarges the center of the displayed image for greater ease in focusing. Also included is a 2.39:1 (cinema scope size) safety zone marker. The terminology is that the sensor is 4/3 which means an inch and 1/3, which is obviously a little more cumbersome to say. This is the diagonal measurement and in this application, in spite of the fact that the imager is 4/3 in 4:3 aspects, it is still 4/3 in 16:9. The mount that the camera uses is a micro 4/3 mount which means that there is no mirror in the way like a typical DSLR, and thus the mounting is fairly shallow. You can take advantage of all of the adapters that have been made to adapt lenses to popular Micro 4/3 still cameras.